(NaturalNews) After eight months of laboratory method development and product testing, today I'm announcing the first 100% authentic, full spectrum cannabinoid hemp extract that meets my strict requirements for scientific analysis and molecular authentication. Native Hemp Solutions is a new brand, jointly developed with EnerHealth and CWC Labs (my science lab), and its analysis is based on a breakthrough new mass spec analysis method that I pioneered over the last eight months. Because there's a lot of counterfeit CBD in the industry today -- and wildly inaccurate label claims all over the place -- the importance of establishing a trusted, scientifically valid brand simply can't be overstated. Now you have a hemp extract with natural cannabinoids that you can completely trust to be honest and accurate. The new method, based on LC-MS-TOF analysis, took me over eight months to develop with my team at CWC Labs. It is now, by far, the most advance hemp analysis method in the scientific community, capable of orders of magnitude greater sensitivity, accuracy and reproducibility compared to traditional analysis methods used by other labs. It simultaneously measures the concentration of individual cannabinoids (CBD, CBD-A, CBG, CGN, etc.) while also confirming the molecular authenticity of each one. This "molecular identity" confirmation is achieved through advanced mass spec analysis methods that include accurate mass, ion fragmentation and isotopic spread analysis, none of which are achievable via traditional HPLC analysis used by most hemp industry labs. 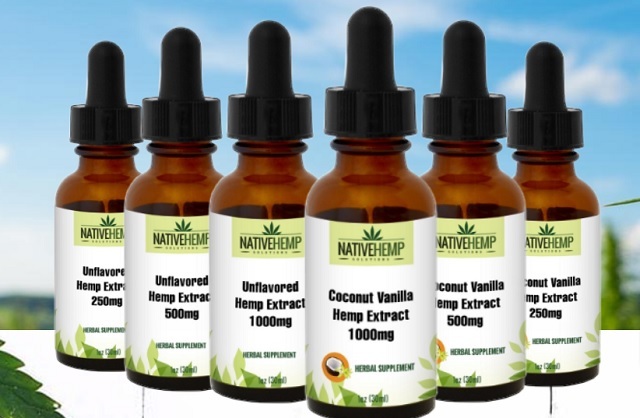 All Native Hemp Solutions extracts are extremely low in THC (only "trace" levels, not even detectable by most labs) while containing very high levels of naturally occurring cannabidiols, which include primarily CBD (cannabidiol) and CBD-A (cannabidiolic acid), both natural molecules in their natural ratios from nature. Because they are full spectrum spagyric extracts, Native Hemp Solutions cannabinoid oils contain all the naturally occurring phytochemicals expressed by the original plant. This means they contain the terpenes, macro minerals, trace minerals, pigments and other plant-based molecules that provide a full synergy of functional molecules, just like Mother Nature intended. The total potency of CBD + CBD-A is available as 250mg, 500mg or 1000mg per fl. oz. (each bottle is one fluid oz., or 30 ml). The rest of the solution is made mostly of MCT Coconut Oil and Organic Grape Alcohol (GMO Free, Gluten Free). The scientific analysis results for each lot will soon be posted online at CWClabs.com so you can look up any lot number printed on the bottle and see the actual testing results. Native Hemp Solutions hemp extracts are shipped from Colorado and are legal in all 50 states. Shipping is free across the USA, including Hawaii, Alaska and Puerto Rico. It is currently not available for sale outside the United States. This first production lot begins shipping this Friday on a first come, first-served basis. Get your order in now at NativeHempSolutions.com.